The 1971 Hammer film Hands of the Ripper tells the story of Anna (Angharad Rees), a woman living in Victorian England who has a few issues. What type of issues, you may wonder? Well, first off, she’s the daughter of the infamous serial killer known as Jack The Ripper. When she was just a baby, her father killed her mother while Anna watched from her crib. Now, years later, the teenage Anna is working for a fake medium named Mrs. Golding (Dora Bryan). It’s Anna’s job to stand behind the curtain and provide the ghostly voices whenever Mrs. Golding is holding one of her fake seances. One such séance is attended by both a sleazy member of Parliament named Dysart (Derek Godfrey) and a progressive psychiatrist named Dr. John Pritchard (Eric Porter). When Mrs. Golding’s ruse is discovered, she decides to “give” Anna to Dysart. However, this plan falls apart when Anna suddenly goes crazy, grabs a fireplace poker, and murders Mrs. Golding. Dysart flees the scene, leaving Anna, who claims to have no memory of attacking anyone, with John. Assuming that he can cure her, John takes Anna in and set her up at his house. Well, it turns out that curing Anna will not be quite as easy as John assumed. For one thing, Anna is extremely repressed and often refuses to open up to him. Also, there’s the fact that Anna keeps killing people. Whenever anyone stands to close to Anna or kisses her on the cheek, Anna goes into a trance and hears her father’s voice demanding that she kill. John, convinced that he can save Anna, continues to cover up every murder. I really wasn’t expecting much from Hands of the Ripper. In fact, I have to admit that the main reason I dvred it off of TCM was because I thought this might be the film in which Klaus Kinski played Jack the Ripper. I was wrong, of course. The Kinski Jack the Ripper film was called Jack the Ripper and it was directed by Jess Franco. 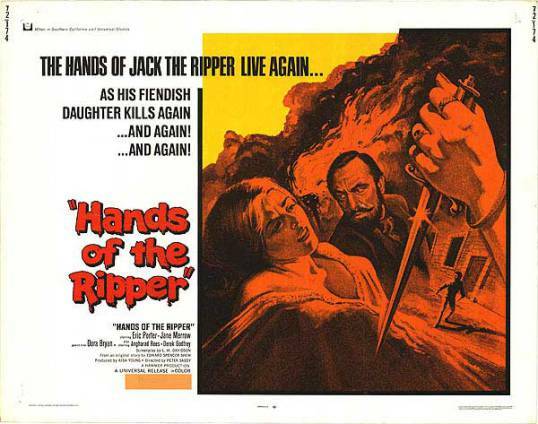 Hands of the Ripper, on the other hand, is a Hammer film that was released in 1971, at a time when Hammer was struggling to stay relevant in an ever-changing cinematic landscape. Perhaps that’s why the murders in Hands of the Ripper were gory, even be the bloody standards of Hammer Films. Interestingly enough, though the film was made over 40 years ago, the murders themselves remain quite shocking. I can only imagine how audiences in 1971 reacted to them. The scene where Anna suddenly attacks a housekeeper made me flinch, as did a later scene in which one of Anna’s victims stumbled out onto a crowded street, minus an eye. Angharad Rees gave a good performance as Anna, one that keeps you guessing as to whether or not she’s just crazy or if maybe she really is possessed by the spirit of her father. Hands of the Ripper is a good Hammer film, one that combines the usual Hammer tropes with a bit more psychological depth than one might expect. This is one to keep an eye out for.